The Ben Nye Tattoo wheel contains the 4 most popular colors for quickly and easily covering up Tattoos. The wheel includes the following shades: NT-2 Tattoo Cover No. 2, MY-2 Mellow Yellow Normal, NB-4 Blue Neutralizer #4, and CC-1 Coverette Ultra Fair. 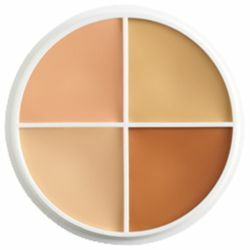 These 4 colors can be used to neutralize the inks of the tattoo, after applying set with setting powder and apply a foundation that matches the skin-tone to blend. Expect 75 – 150 applications per wheel depending on the size of the tattoo being covered.